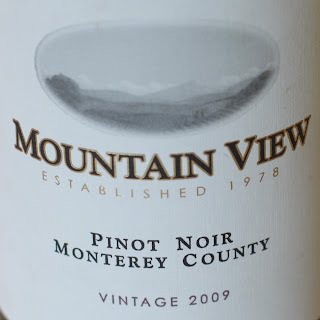 This Mountain View Monterey County Pinot Noir was a lovely colour, bright, light red. It could be mistaken for one of Spain’s more assertive pink wines. It smelled fresh and fruity, and that carried through to the taste, there were fresh squashed cherries and maybe some damsons. These tasted best when it was cool. As the bottle warmed up in the room there was a touch more oak bringing some vanilla and toastiness, but not an overwhelming amount, and not quite enough to make up for he loss of fruitiness. I’d aim to keep it reasonably cool. At £11 from Berry Bros & Rudd it wasn’t cheap and I had the sneaking suspicion that for that money I could have bought something with a bit more complexity from France. Realistically mid-priced American wines aren’t generally a good choice outside the USA, the cost of transport is so much higher than just crossing the channel. I’ll keep having a go now and then, but generally I’ll save myself and just drink American wines in-country.